For many the thought of a huge behemoth aquarium in their living room, kitchen or dining area can be off putting to say the least. Despite the tendency of aquarists (people who create or keep aquariums) to have a preference for larger aquariums, bigger isn’t necessarily better when talking about aquariums as integrated features within interiors. When most people think of aquariums that have been integrated into the structure or interior of a space they usually think of huge awe inspiring installations worth £10,000’s or even £100,000’s. A beautifully designed small aquarium can add just as much life and beauty to a space as a 3 metre long statement feature without emptying the bank account. Whilst the initial impact is more subtle, small aquariums still add a dynamic element to a space creating; light, colour and movement. As I mentioned before fish keepers in general tend to have a “bigger is better” approach when designing and creating their aquariums. This tendency to create the largest possible aquarium (budget permitted) can sometimes lead to a break or disruption within the natural flow of a space. Often the result is a large overbearing eyesore that doesn’t really work with the layout of the room. From a design perspective this can make balancing aesthetics and functionality within a space challenging at best! The purpose of an aquarium within any interior should be to create balance and positive energy whilst adding a beautiful yet dynamic element to the space. The UK is currently going through a small home crisis. An ever increasing demand for more affordable housing as a result of a highly inflated property market, has forced developers to build smaller new homes that sell for less money. This is compounded with the increasing pressure by local authorities and central government to restrict urban sprawl onto green belt land, forcing developers to create homes on space restrictive brown belt land as part of on-going urban regeneration schemes. With limited space and an ever diminishing first time buyer’s market it’s little surprise that the average home in Britain today is 15% smaller than anywhere else in Europe. The average UK home size of 818 square feet is currently 10% smaller than of 30 years ago. With increasing pressure on the government from developers lobbying for the complete removal of minimum size standards, it is totally plausible for the current trend of house size reduction to continue into the foreseeable future. According to studies carried out by RIBA UK houses are currently 8.8% smaller than what they should be, creating a detrimental effect on peoples stress levels and overall wellbeing. Small aquariums solve the problems that can arise when designing or building an aquarium into a small space; as they are easier to assimilate into the physical environment, and so allow for more design options. The smaller footprint means that they can be easily built into corners, alcoves or specially adapted room furniture. They make great accent features by either drawing the attention to particular areas within a space or being part of a wider arrangement. i.e. a seating area or an accented display. In terms of colour most modern and contemporary spaces tend have a subdued palette with stone colours and wood finishes or completely monochrome with white being the new black! 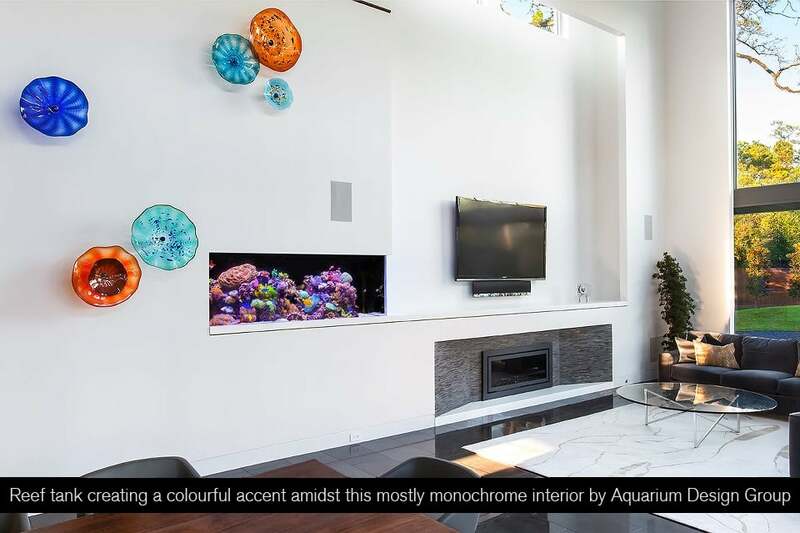 For the designer who likes to add colour through accessorising a small aquarium is the perfect solution to add that splash of colour without disrupting those clean lines that they covert so dearly. Avoid placing near bright light sources like TV’s or computer screens as they will diminish the impact the aquarium and throw the room out of balance. Try to avoid brightly coloured areas and position your aquarium within a surrounding that’s either monochrome (black or white); or has subdued natural (stone/wood) tones like shades of brown or grey. Avoid over stocking with fish and focus more energy on the aquascape (interior layout) as this will play a big factor in the way that the tank impacts on the space. Tidy away any loose wires as they will detract from the overall presentation. Things like loose wiring are more noticeable on small tanks. Don’t let your aquarium get in the way! Small tanks are best situated around the peripheral area of a room. They are generally not big enough to be centrepieces around which furniture and other design elements can be arranged. Within the last 5 years there has been an explosion of technological advances that has made keeping small aquaria a much more viable and affordable option. With an ever increasing population size and a demand for small and more affordable housing, this sector of the aquatics industry is set to expand massively within the next 10 years. With the implications of cramped housing having an overall impact on general health and wellbeing it is totally foreseeable that small aquariums could increasingly become more popular with future home owners as they look for alternative ways to improve their quality of life.